I am planning an epic Banh Mi fest with friends soon and i’m super excited. I love the Banh Mi sandwich (also known as the Vietnamese Sub) and still to this day am disappointed it took me so long to try one. I have never been a fan of subs so the thought of a vietnamese sub did not appeal to me in the slightest…but then I found out it was the same delicious grilled meat I enjoyed with my vermicelli noodles and I lost my mind!! All over Vancouver you can find these delicious sandwiches for like 4-5 dollars and they are amazing value for a delicious sandwich. I will share my recipe for Banh Mi in an upcoming blog post but today, I wanted to share with you one of the accompaniments and absolute necessities in creating a good bahn mi….those delightful pickled veggies on top of the sandwich. They are normally a mixed variety of daikon (radish), carrots and cucumbers. They are crunchy, sweet and sour and they are awesome. I decided I wanted to make a little container of these little gems to really bring the bahn mi to life. 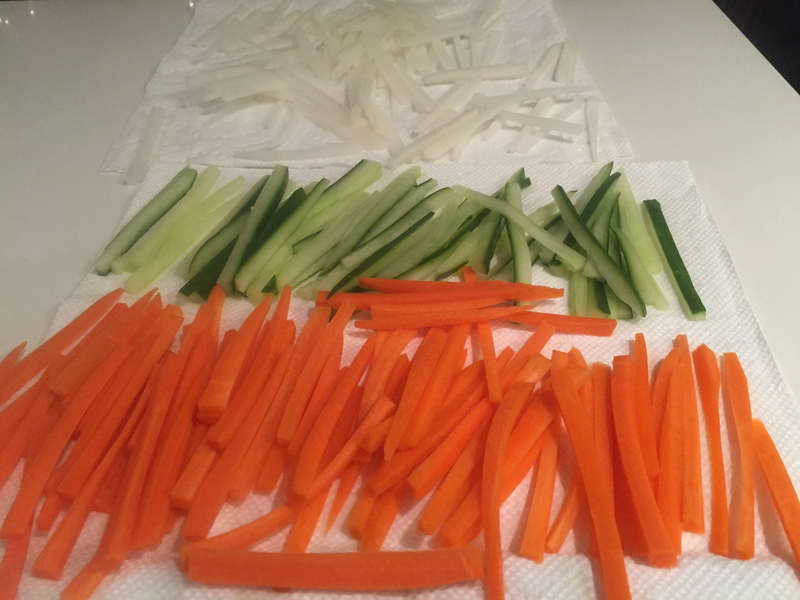 All I did was julienne carrots, daikon and cucumber. (I did 2 carrots, a quarter of a daikon and about 1/2 a cucumber). Now, the one thing I make sure I do is remove all of the seeds from the cucumber so you can keep the crunch and get rid of the water. Notice that I placed all of the sticks on some paper towel for a few minutes to release some of the water. I don’t want to dilute the pickling mixture in anyway. Next mix up your pickling liquid. It’s basically rice vinegar, water, sugar and red chilli flakes. I like to add a bit of heat but if you don’t want to, just omit them. You want to stir this mixture around to make sure that all of the sugar is disolved. You don’t want any grittiness. 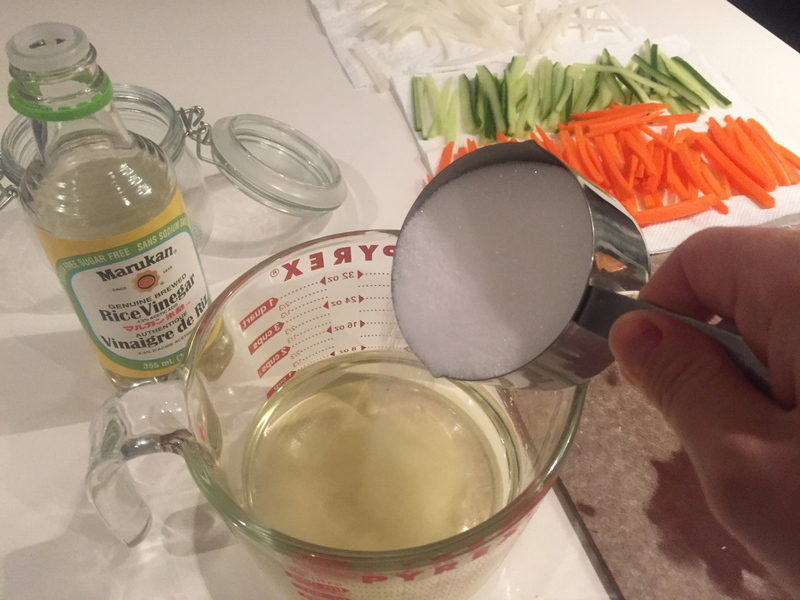 Mix up that sweet, sour pickling juice. A cup of pickle juice anyone??! Now stuff as many of those julienned veggies in to your clean glass container. Once you have them all in, pour your liquid to the top of the jar and close the lid. Pour the liquid to the top and close the lid. Let the pickling begin!! * I ended up making 2 containers of these pickles because I am entertaining friends and making a lot of sandwiches. If you just want one of the containers featured in the picture, feel free to cut the pickling mixture in half. 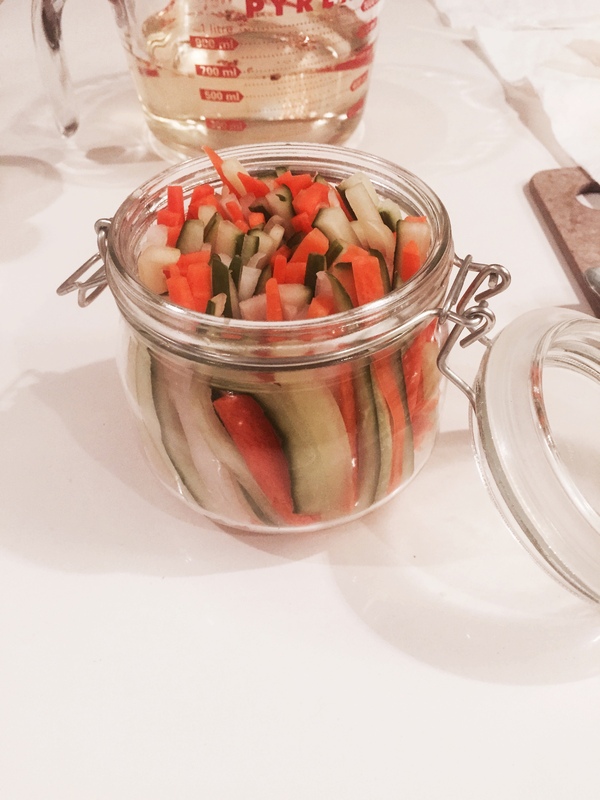 Place in your fridge for a few days and then your pickled veggies will be ready. Now, I will confess…I have been impatient in the past and have opened that bad boy up within 3 hours and they were still wicked delicious!! (this pickle can handle the impatient people in your world). I do find that they taste absolute best after 3 days. Once veggies are julienned, leave them on a paper towel to dry a bit and get rid of some of the water they contain. 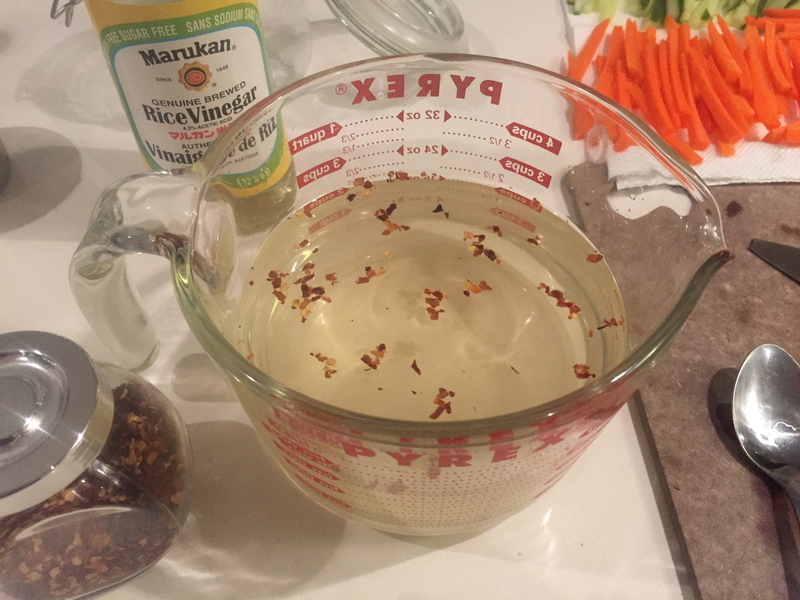 Combine the sugar, rice vinegar, water, salt and chilli flakes in a measuring cup and stir to make sure all of the sugar and salt is dissolved. Stuff all of the veggies in to a glass container/ mason jar and then pour the pickling liquid over top making sure the tops of the vegetables are completely covered. 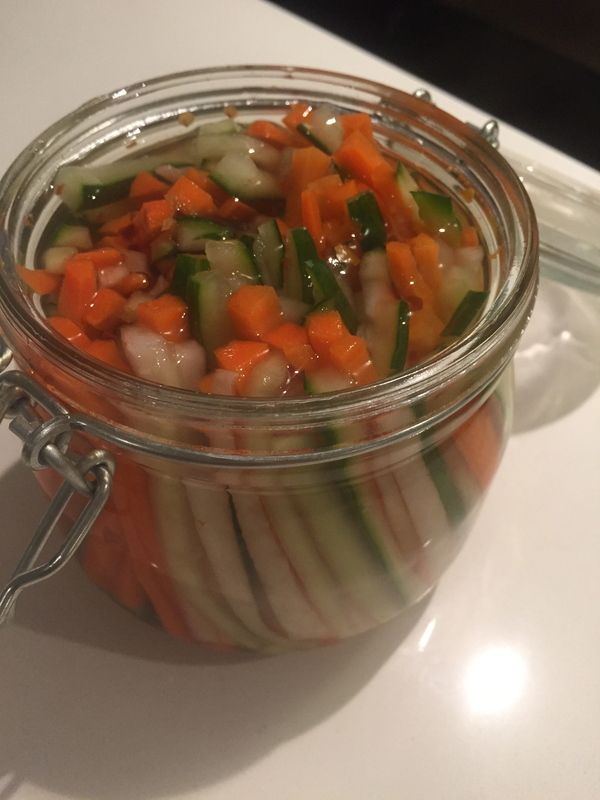 These pickles will be ready within 3-5 days and be flavour packed!! These little pickles make any sandwich come to life but they are absolutely essential when making a banh mi!! Can’t wait to show you the finished product when they are ready and they top my delicious lemongrass pork banh mi sandwiches. Stay tuned moody friends!! I don’t mean to nit picking but since i am Vietnamese, i just want to share with you that the correct spelling is Bánh Mì, not Bahn. I like your recipe of quick pickle. It taste good with any grill meat dishes. Thanks so much imperfection for the catch. Typing fast while wrangling a toddler makes for many mistakes. Appreciate you letting me know. I will change it. Thanks and Happy New Year! !